This classy almond cake hides many secrets. For starters, the original recipe from “The Art of Fine Baking” is ambiguously titled just “Hunter Cake.” What is “Hunter Cake” and where does it come from? Your guess is as good as mine. Although I tried researching this mysterious cake title, I found little that resembled this recipe (think camouflage frosted cake with various fondant animals and rifles). Other secrets of this cake lie within the ingredients. At first glance, a cake without flour may sound like a recipe for a rock. However, as my grandmother showcased in her gluten-free chocolate cake ring recipe, moist light cakes are not only possible without white flour, but delicious. Grated almonds act as a replacement for white flour but provide more flavor and protein. Although I’ve previously used ground almonds as a substitute for grated, they seem to weigh the cake down a bit and make it slightly heavier. But who really has time to grate over 3 cups of almonds? Enter almond flour. This nutty flour is essentially grated almonds and makes recipes like these a whole lot easier. You will pay for it though – almond flour runs $10-$15 per lb. With all this talk about a moist light cake, you may be wondering how much butter or oil is needed. The answer is none. No butter, oil, or shortening of any kind is used. The secret of this fluffy cake lies within the egg yolks and stiffly beaten egg whites. 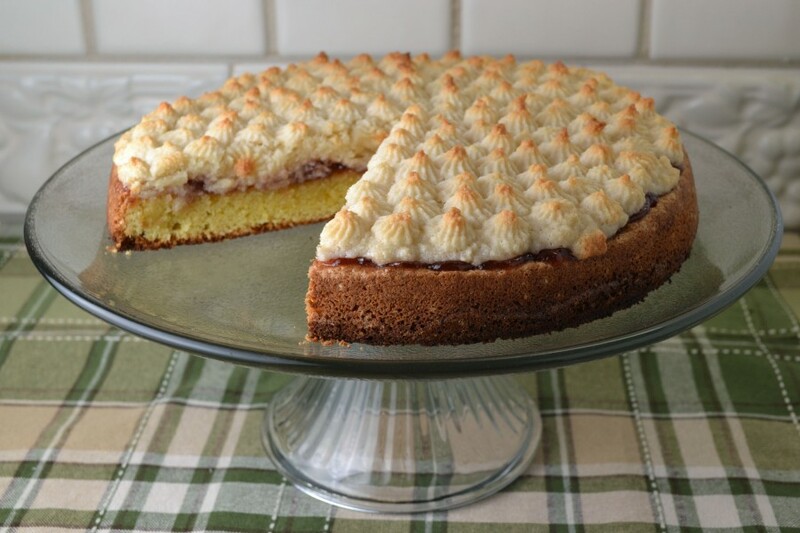 Both the cake itself and the topping contain egg whites and although the topping is much like a meringue, it takes on a totally different texture with addition of the grated almonds. The finished moist cake layered with tart jam and almond meringue topping reminiscent of frangipane, will not only surprise you but keep you guessing. Preheat oven to 350 degrees. Grease the bottom of a 9-inch spring form pan. Finely grate unblanched almonds (if using instead of almond flour). Add lemon zest and vanilla to egg yolks. Stir lightly with a fork to break them up. Beat egg whites until they form soft peaks. Add sugar, a little at a time, beating well after each addition, until whites are very stiff, about 5 minutes in all. Pour egg yolks over whites. Sprinkle almond flour or grated almonds over them. Fold gently together. Pour into prepared pan and bake 30-40 minutes until cake is lightly browned and springy when gently touched. Begin preparing topping when cake has backed about 20 minutes: Grate unblanched almonds, if using. Combine egg whites, lemon juice and vanilla. Beat until egg whites hold soft peaks. Add sugar, a tablespoon at a time, beating well after each addition, until whites are very stiff, about 5 minutes in all. Fold in grated almonds or almond flour. Remove cake from oven and quickly spread top with a thin layer of raspberry jam. Spread half the topping over jam and press remaining topping through a pastry bag fitted with a large star tube. Replace cake in oven on a high rack. Bake 30-40 minutes longer or until top is golden brown and set. Cool cake in pan. Adapted from “The Art of Fine Baking” by Paula Peck.